I like this as a roller based equivalent to the 2x20 workout. The last 5 minutes of the first 20 are hard. The second five minutes of the 2x5 minute efforts is hard. 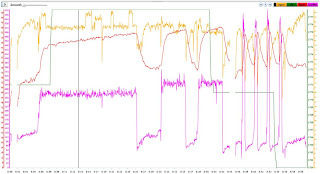 The 4x30second AC efforts toward the end actually weren't that bad, but modulation at, and not above, the target wattage lest end of interval fade creep in. 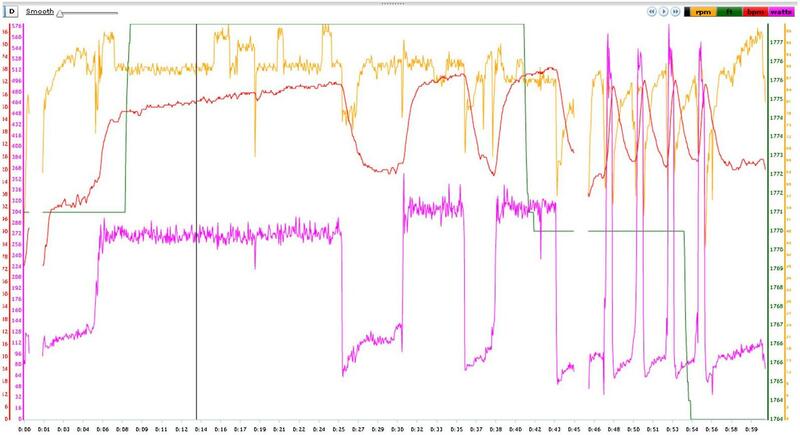 The 2x5 minute efforts at supra threshold serve to basically compress what would be the second 20 minute effort of a 2x20 into a shorter, more intense time frame, especially given the short TBI that separates them. Tried to keep the cadence high during the 20 minute interval, but wattage would fall off. Couldn't quite find the right gear to keep it in the mid-90s so I slogged along in the high 80s-low 90s for most of it, except for the occasional peaks where a relief/recovery spin up was sought. Cadence for the 2x5 minutes had to stay pretty low too, see interval 2, like I said, it was hard, err, challenging. I didn't read the TBS correctly between the 2x5 and the 4x30s intervals...thought it was 5m, but was supposed to be 2.5m. Anyway, the break-point is where I had to switch to some Radiohead to get me through to the end, resulting in a 3.5m TBS. Oh well.